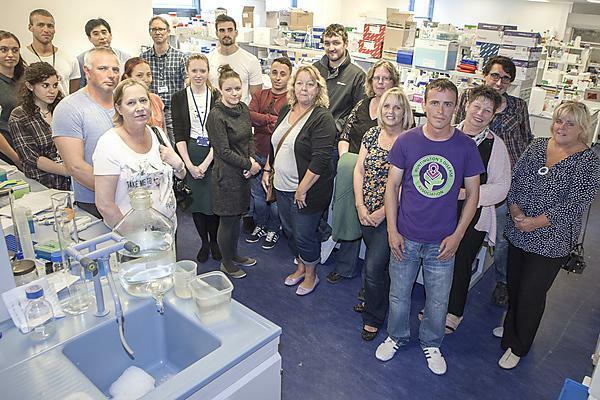 Local people affected by Huntington’s disease have visited laboratories at Plymouth University Peninsula Schools of Medicine and Dentistry (PUPSMD), to see the facilities and meet the research team working to find a treatment for the disease. Around 20 people with Huntington’s, their family and friends, visited PUPSMD where they had a tour of the labs and found out about the latest research carried out there. Researchers showed the visitors around the facilities, which included cell culture, state of the art microscopes and other aspects of the labs. Researchers from PUPSMD recently received a grant of nearly £520,000 from the Medical Research Council, to investigate the potential of manipulating activity at a cellular level in order to develop an effective therapy for Huntington’s disease. The team will analyse a protein called Bim, which causes cell death in various tissues including those of the brain. At present it is unclear how Bim levels and activity increase in Huntington’s disease, and the study will aim to identify the mechanism which allows this increase. By understanding the mechanism and how it works, the way could be open for manipulating it to create an effective therapy for the disease. Huntington’s disease is an hereditary disorder of the nervous system caused by a faulty gene on chromosome four. The faulty gene leads to nerve damage in the area of the brain resulting in gradual physical, mental and emotional changes. Those born to a parent with Huntington’s disease have a 50:50 chance of developing it, and there is currently no cure.